A folk rock band, Eastern Soul Players (ESP) recently released a folk song based on Lokogeet. The song ‘Jotadhari’ is available at http://www.reverbnation.com/easternsoulplayersesp. EASTERN SOUL PLAYERS (ESP), a folk rock band from Jorhat, Assam started its journey in 2010. But even before the band was formed, the band members were performing in different genres and were often spending time together chatting and discussing various aspects of folk music of north east India parallel the other genres of the west. The first performance of the band dates back to January 2010 with limited number of composition but an inspiring feedback from the viewers. Till then, the bands have been trying to work on folks like dehbisaror geet, tukari geet, lokogeet, and the like and have been composing jazz and reggae. Since birth, the band have spend years in knowing folk rock and by this time experiments with several compositions were completed successfully. The lyrics usually deals with mythology, philosophy and spiritualism. By 2013, the band came out with full might and started performing live. With the expected support from the viewers and wellwishers, the band started recording their assets that they had created so far. ‘Jotadhari’, ‘Axutuxo’, ‘Kuji Baai’, ‘Vobo Boitoroni’, ‘Pita Putro’, etc are some of the compositions of EASTERN SOUL PLAYERS (ESP). The song ‘Jotadhari’ is based on the tune of folk-songs or Lokogeet. The band does not claim it as a Loko geet, but in respect of the lyrics and tune, the song which deals with a myth tends to approach what is called Loko geet. Jotadhari, being all about Lord Shiva, creates an imaginary scene of Kailash in listeners mind and provides a sense of spiritualism. The characters mentioned in the song are Lord Shiva, his followers Nandi and Bhingi, His wife Mother Parvati and his sons Karttik and Ganesh. The 6th edition of Pragjyoti International Dance Festival (PIDF), organized by Kalpa, starts tomorrow. Conceptualized to exhibit the wide range of India’s classical dance forms together on one platform to sing in unison and to celebrate the rich heritage of Assam, the six-day classical dance extravaganza will be held in Guwahati, Kaziranga and Sivasagar from 15th-20th February, 2014. The event is an annual feature by Kalpa society held in association with the Sivasagar District Administration, Indian Council of Cultural Relations (ICCR), Ministry of External Affairs, Govt of India, Assam Tourism Development Corporation Limited (ATDC), Directorate of Cultural Affairs (Govt of Assam) and Sub-Divisional Office- Bokakhat. The festival is powered by ERD Foundation. The 6th edition of Pragjyoti International Dance Festival will offer a tribute to the contribution of the 600-year-old Ahom rule towards society and culture of Assam and will be hosted in the cultural site of Siva Dol, Sivasagar sculpted and spaced by the aesthetic vision of the Ahoms. Through the dance movements and unique expression of a dancer’s language of the mind perceiving the world and its cosmos, the PIDF will communicate the gloried past of the Assam and the Ahom dynasty and momentous contribution of the kingdom towards Indian History. With this, Kalpa also attempts to introduce PIDF as the “Dance Festival” exploring the heritage sites of Assam, inviting renowned young exponents from Poland, Russia, Italy and various parts of India representing various classical dance forms like Kuchipudi, Kathak, Mohiniattam, Manipuri, Bharatanatyam, Odissi and Sattriya. Also addressing to the need of the hour, the festival will speak up for the conservation of nature and preservation of rhinos, making the masses aware and rethink about the pertinent issues of the land and its natural resources by dedicating the evening of dance for the conservation of its pristine glory. Sattriya danseuse Anwesa Mahanta, Joint Secretary of Kalpa & Festival Director of PIDF says, “Since the past six years, PIDF has been striving towards building an interest for classical dance in the hearts of the youngsters of this region. This year, we want to address two issues that have been on the minds of many people of the region, and yet, were unable to express them for lack of a proper platform. PIDF is a festival of the people, carried forward over the years with their continued support and participation, and designed for highlighting the aspects of our vibrant culture and heritage. We want to use this platform as an opportunity to express our concern towards these issues”. Besides the dance performances, Kalpa has also organized a series of interactive sessions, namely ‘Voices’, in three educational institutions in the city on the days of the festival. Through these sessions, the students will get an opportunity to learn and interact with the various classical dancers performing at the festival. These interactive sessions aim at creating awareness about the various classical dance forms of the country and to encourage more and more youngsters to take up these dance forms. The ‘Voices’ sessions will be held at Delhi Public School, Don Bosco Institute of Management and Regional Institute of Science and Technology on 15th, 16th, 17th February respectively. “Our dance festival is an attempt to promote the intangible heritage of classical arts among the younger generation. Dance is an interdisciplinary area that requires a holistic appraisal of literature, philosophy, history, science, music, painting, sculpture, yoga, spirituality, religion, art and so on. Pragjyoti International Dance Festival, now in its sixth year, is one such attempt to showcase Indian classical dance with its holistic understanding of time, space and sound and the interpretations of human mind and body to the context of Assamese heritage, history and its nature”, says Anwesa. 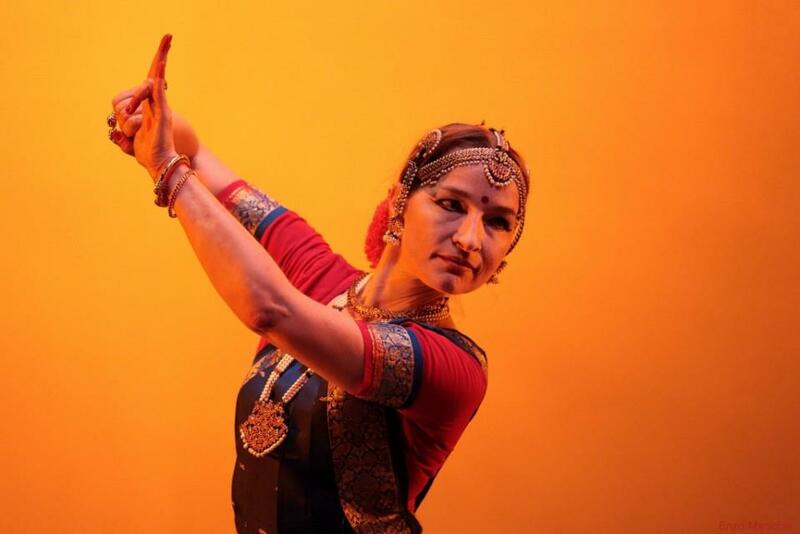 While one of the greatest achievements of PIDF has been to develop interest about classical art traditions and its relevance in contemporary period amidst the young generations it has also maintained high standards by garnering the support and accolades of exponents of Indian dance at this annual dance fest. Appreciating the efforts of Kalpa, Anurag Singh (Managing Director – Assam Tourism Development Corporation Ltd.) comments, “Pragjyoti International Dance Festival is a vibrant festival with international renowned artists performing in Assam. It gives us an opportunity to promote our diverse culture and tourism. It’s a season’s gift of dance and tradition to the people”. For alternative and pop music lovers of the city, there is reason to cheer. Popular all-woman, all-attitude alternative pop music trio from New York City, Betty, will be arriving in the city to perform at Alcheringa – the biggest event of IIT Guwahati’s annual calendar. 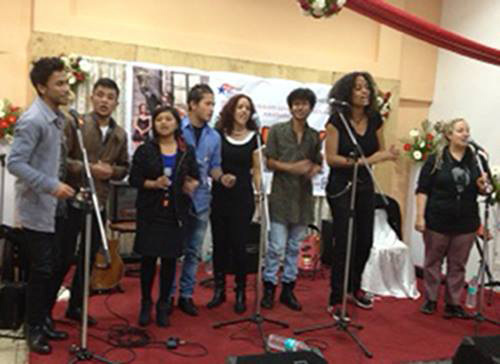 The performance of the pop group has been facilitated and sponsored by the office of the U.S. Consulate in Kolkata. Unstoppable activists, the women of BETTY use their music for humanitarian outreach: working for equal rights, peace, and the empowerment of girls and women. The band had performed in the neighbouring hill station of Shillong yesterday. The band also performed at Alcheringa, the annual cultuarl festival of IIT- Guwahati. Prior to their performance in Guwahati on Sunday, the band had an exclusive interview scheduled for mediapersons at the Guwahati Press Club today. The Deputy Director of the American Center Kolkata, Rachel Sunden will moderate the press conference. BETTY is a pop rock band fronted by Elizabeth Ziff, Alyson Palmer and Amy Ziff. The band’s unique sound is a blend of tight harmonies layered over rocking guitars and a solid rhythm section. Since 1986, BETTY has performed their memorable live show – full of exciting, hook-laden songs, clever word play and manic energy – in clubs, theatres and public arenas all over the world. The band has toured in the U.S., Lithuania, Estonia, Latvia, Russia, across Western Europe, Scandinavia and Argentina. Fierce Elizabeth (vocals, guitar), funky Alyson (vocals, bass) and funny Amy (vocals, cello) are the songwriters. BETTY’s last release “Rise” is a hit featuring the song the band wrote in 2013 for Eve Ensler’s global campaign to end violence against women and girls, One Billion Rising. Unstoppable activists, the women of BETTY use their music for humanitarian outreach: working for equal rights, peace, and the empowerment of girls and women. It is powerful music, and you can dance to it! With music bearing the message of peace and empowerment BETTY, has been harmonizing arts and activism for almost three decades. Since 2012, the trio has brought their unique blend of music and social issues to local communities across the world via U.S. State Department programs. As U.S. Arts Envoy, BETTY’s music with a message seeks to spread equality, tolerance, and anti-bullying in an effort to fight gender-based violence and homophobia. While in Guwahati, BETTY also met with representatives from the civil society, non-profit organizations, government officials and local youth leaders via a U.S. Consulate Kolkata outreach program in association with YI (Young Indians of CII). BETTY’s engagements in Guwahati are part of the trio’s January 29 – February 9, 2014 India Tour that has the band travelling to Shillong, Kolkata and Hyderabad. Guwahati-based cultural organization Nrityanjali Academy is upbeat after the success of their international art exhibition, The Bridge, held at Thimpu last year. The exhibition, held at Nehru Wangchuk Cultural Centre at the embassy of India in Thimphu, was organized in collaboration with the Nehru Wangchuk Cultural Centre, Embassy of India Bhutan and paid homage to noted Assamese artist Sobha Brahma on his 84th birth anniversary. This was informed by Aditi Chakravorty, member of Nrityanjali. 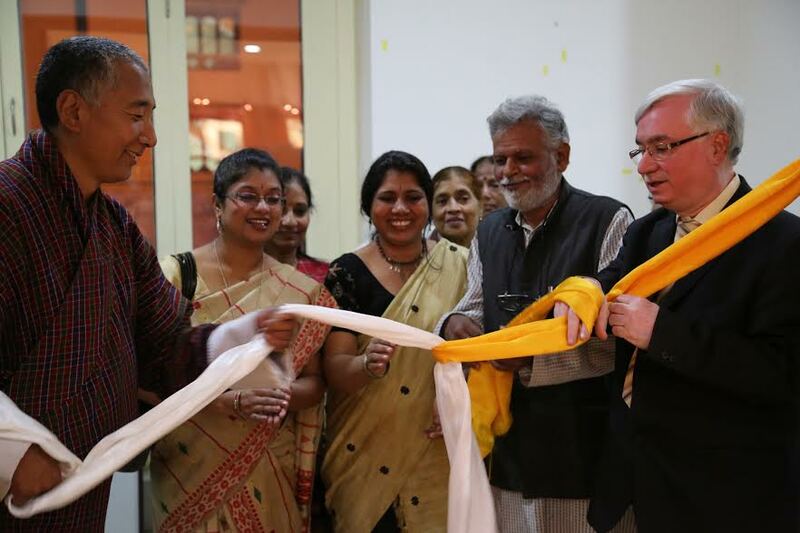 Kama Wangdi, senior contemporary artist of Bhutan had inaugurated the four-day exhibition that showcased paintings of Sobha Brahma and 31 other Indian artists. The inaugural function was graced by Lyonpo C. Dorji, Chairman, Royal Privy Council, Dasho Dorjee Tshering, DG Department of Culture, MOHCA, RGOB, Mrs. Bharti Mohan Babu and other contemporary artists from Thimphu. Eminent artist Ravindra Verma has highlighted the life and works of Sobha Brahma to the present audience. In his address, he invited the Bhutanese artists also to visit India to display their works. He hoped that this cross border interaction would act as a bridge between the two nations. A total of 57 works, which included abstract, realistic, figurative and other forms of paintings, were on display, Aditi informed. ‘Sobha Brahma-The Immaculate Visionary’, a documentary by Sibanan Barua, was also screened in the inaugural evening. The movie as it were brought back Late Brahma to life. During the exhibition period, a group of participating artists visited the Vast Gallery, Thimphu, Bhutan on invitation from Founder of the gallery Mr. Kama Wangdi. The group witnessed a grand installation work being put up by a team of artists under the guidance of Mr. Wangdi on the bank of the Thimphu, a spot of tourist attraction. Manika Devi, Aditi Chakravarty and Prabin Kumar Nath, the main members of the organizing team, informed that Vijaya Brahma, wife of late Brahma and his two daughters also attended the inaugural function. The participating artists were from Assam, Tripura, West Bengal, Rajasthan, Maharashtra and New Delhi. They were: Neel Pawan Barua(Assam), Ravindra Verma( New Delhi), Noni Borpuzari( New Delhi), Vilas Shinde (Mumbai), Ajit Seal ( Shantiniketan), Champak Borbora (Assam), Atul Chandra Baruah (Assam), Meena Baya( Rajasthan), Munindra Narayan Bhattacharya (Assam), Lutfa Akhtar (Assam), Madhusudan Das (Assam), Suresh Kumar (New Delhi), Asurvedh (New Delhi), Simanta Jyoti Baruah (Assam), Prabin Kumar Nath (Assam), Subhakar Laskar (Assam) Ashwani Kumar Prithviwasi(New Delhi), Maneswar Brahma (Assam), Vijaya Ved (New Delhi), Sansita Gogoi. C (Assam), Khil Bahadur Chhetri (Assam), Jyoti Kumar Kalita (Assam), Manika Devi( Assam), Niva Devi (Assam), Gautam Kumar Goswami (Assam), Parikshit Baruah (Assam), Aditi Chakravarty (Assam), Siva Prasad Marar (Assam), Promud Boruah (Assam), Joydeep Bhattacharjee (Tripura), Jayanta Bhattacharya( Tripura).